Sand Storm is Eleventh in the Wildcat Wizard series of books by author Al K. Line. Picking up some time after the close of Empty Heart, life for Arthur and his family have returned to semi-normalcy. That is until the screaming head of his dead mentor Zewedu starts to make unannounced appearances. What could this strange long-dead African wizard want from Arthur that he would relentlessly torture him and his family? In order to find out why the specter has returned after many years; Arthur must do the one thing he truly thought he would never have to do. With Wand tucked away in a pocket and Grace snugly on his head, Arthur boards a plane back to where it all began for him as a wizard. But for the Hat, the trip back is not a pleasant experience as he finds himself on what could arguably be the biggest artifact quest of his mortal life. Obtaining the item in question is one thing but keeping it and himself safe while attempting to leave Ethiopia is another thing entirely. 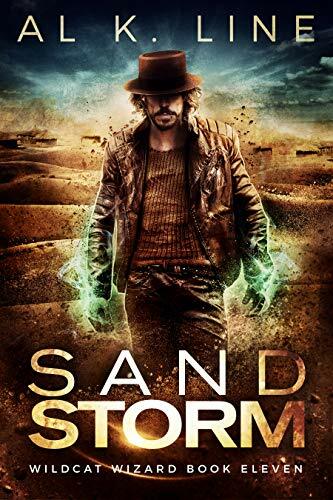 Sand Storm is a bit departure from the previous books in the series. While I have become accustomed to Arthur’s antics including, at the very least, Vicky and at the very most, half of the wizarding community this time Arthur is all on his own. Embarking on an adventure that rivals all the Indiana Jones movies combined, Arthur encounters ghostly specters, thieving adepts, crazed fanatics and if that wasn’t enough… vampires. Really, the sheer amount of craziness that goes on in this book made me tired at times just reading it. Arthur really has his work cut out for him as he tries to protect Zewedu’s final “present” to him and get back to civilization and just when it looks like he may have found an ally in all of the madness Line tosses in a twist that even though I should have seen coming, I still was surprised. With this series winding down, it was nice to see a story that focused solely on Arthur. While I missed Vicky at times, it was a nice change of pace to have her there to complicate an already messy situation. Also taking the action out of the normal locations and moving it to Africa allowed more creativity with this book and more crazy situations for the grumpy old wizard. I really loved the storytelling in this one and with the scenery involved, I could really picture the places and events even though I had ever been in that area of the world. That is a sign of a good author, and one of the reasons that I really enjoy Al K. Line’s books so much. In returning to Arthur’s past, we were able to get not only a glimpse into his early life as a wizard but also a rare look into his heartbreaking younger years. As I eagerly await the final book in the series, Sharp Edges, part of me wants a happy ending. A resolution where Arthur can live out the rest of his days in relative happiness with George, Vicky, Penelope, and Sasha without any more craziness or the threat of Cerberus dropping any more bombs on his house. If I have learned anything about the Hat, it is that nothing for him is easy. Even if a happy ending is in the cards, it will be one heck of a road to get there. We also mustn’t forget that Death awaits to bestow his mantle to Arthur with his next and final death. Is it possible that we will see the end of the Hat and the beginning of a new era of a Grace wearing reaper? All will be made clear soon and I’m sure whatever the outcome, it will be a fitting end of this series.